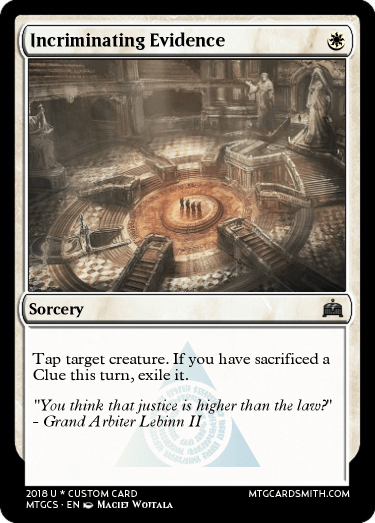 Welcome to Stage 7 of The Great Cardsmith Designer Search (GCDS)...The Gauntlet! This is a closed contest. Only those who have already qualified may participate. This challenge is designed to test your ability to balance a set of constraints against top-down design. Only the cardsmiths with the best overall submissions will win the Grand Prize and Eternal Cardsmith glory!!! 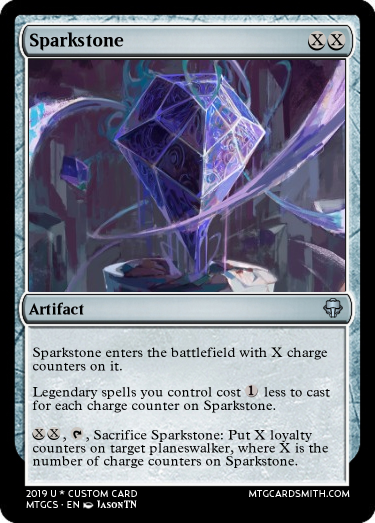 Your task is to design 7 cards with strong Dominarian flavor that collectively satisfy the following list of constraints and would reasonably coexist in the same set..
1. A card that generates mana in some way. 2. 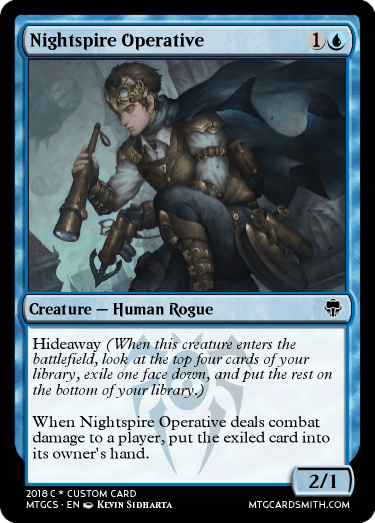 A card that uses an existing non-evergreen mechanic that isn't transform. 3. A 3 color card. 4. 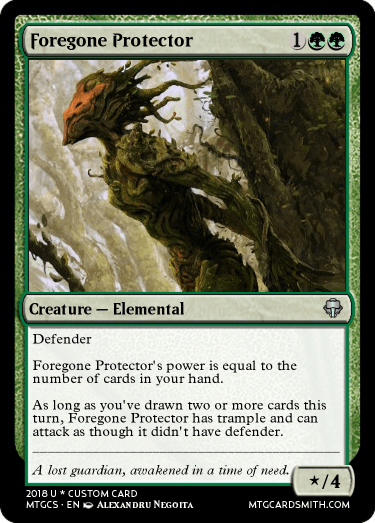 A creature card with base power and toughness both greater than its CMC. 5. 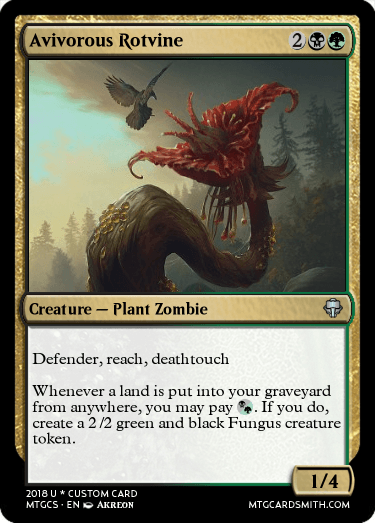 A card that is some kind of graveyard hate. 6. 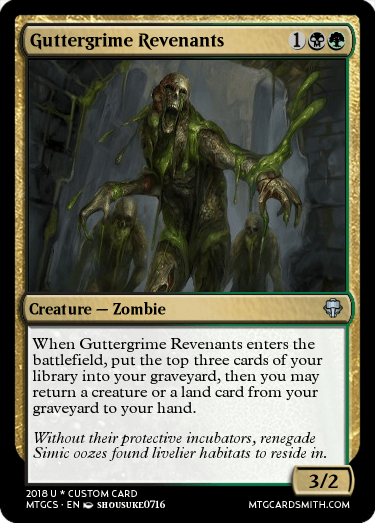 A card with an activated ability that only works in the graveyard. 7. 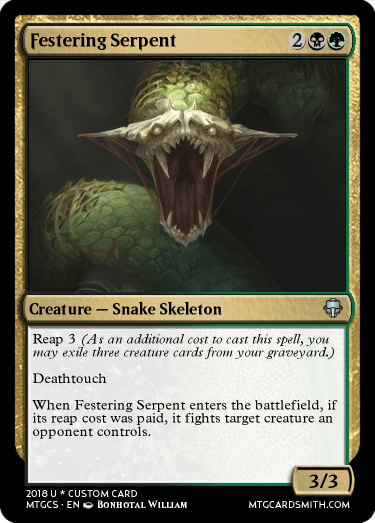 A card with a name that is 5 words. 8. 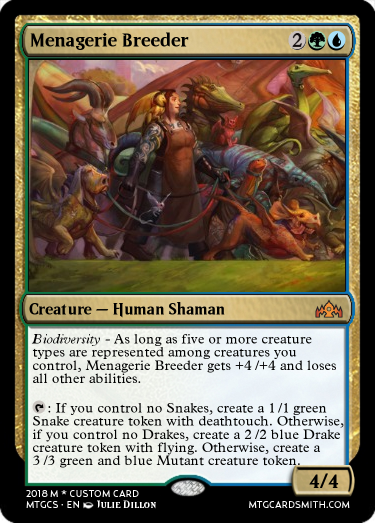 A creature card with 3 creature types. 9. 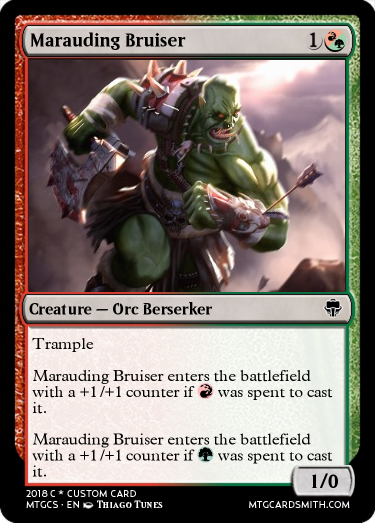 A card with an enters the battlefield ability. 10. 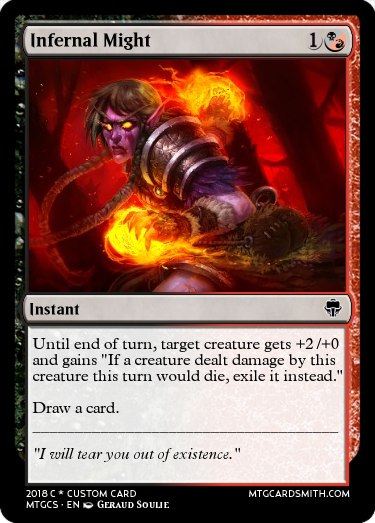 A card that is a guaranteed 2-for-1 if it resolves. 11. 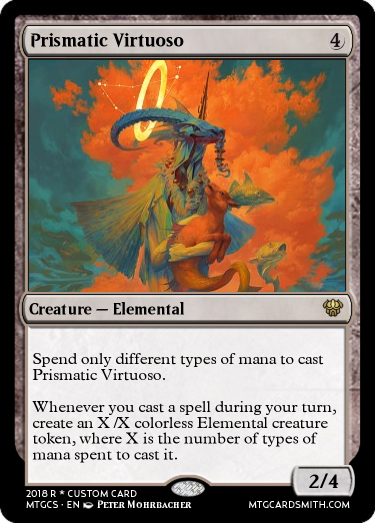 A card with an alternate or additional casting cost. 12. 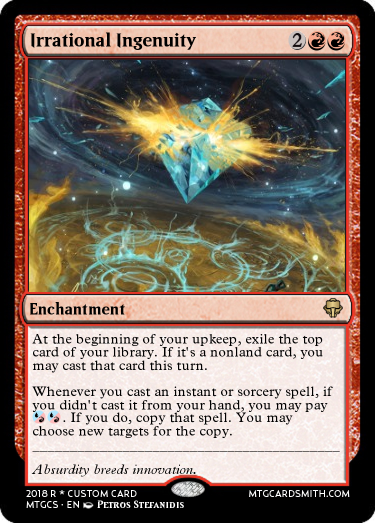 A card with "Costs 1 less to cast" in its text box (You may use a number other than 1 if you want). 13. 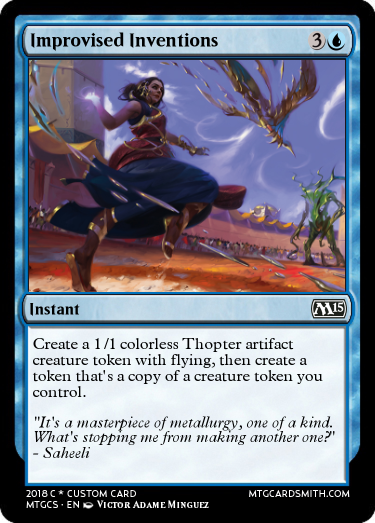 A card that can make a token. 14. 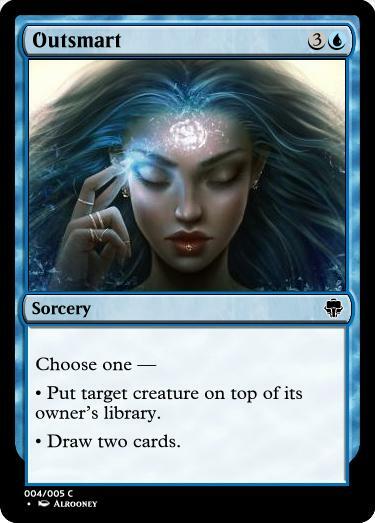 A card that says "Choose one". 15. 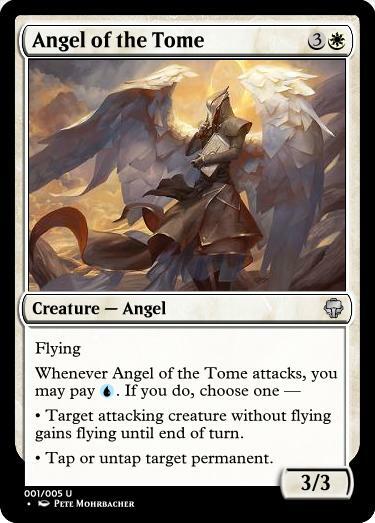 A card with an Iconic creature type (Angel, Sphinx, Demon, Dragon, Hydra). 16. 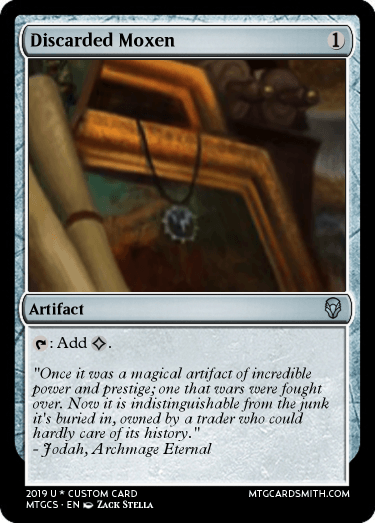 A card that mechanically hints at/references one of the Power 9. 17. A card with a tap ability. 18. 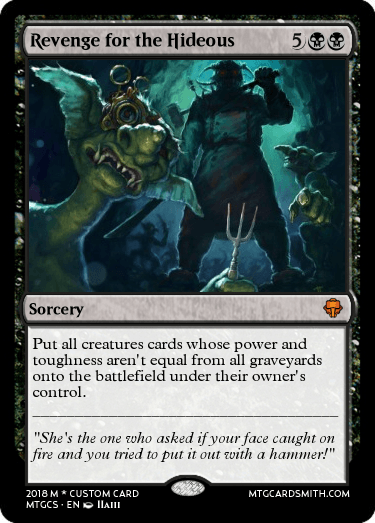 A card with only one sentence of rules text. 19. 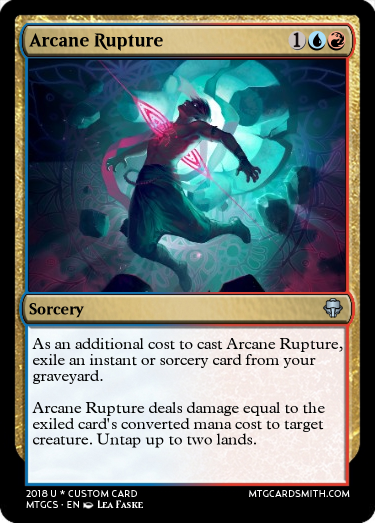 A card that can remove some type of permanent in some way (bounce, destroy, exile, etc.). 20. 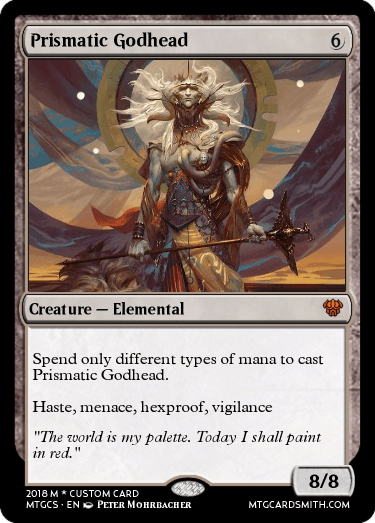 A card with a quote as flavor text by a famous MTG character. 21. 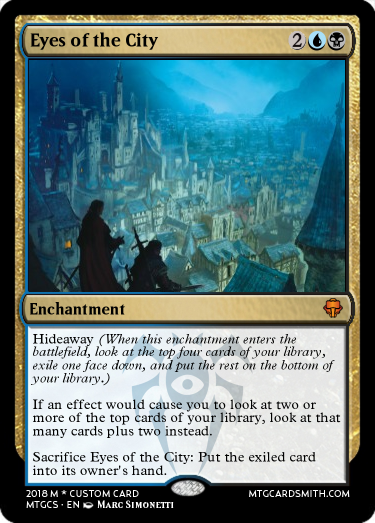 A card that searches of looks at cards in your library. 1) All 7 cards must be submitted as one post. Incomplete entries will not be judged. Entries can be edited until the judging deadline. If you edit an entry, please let me know by posting in the thread. 2) In addition to all evergreen mechanics, All non-evergreen mechanics and custom mechanics of your own design may be used. No more than 2 of each rarity may be submitted. 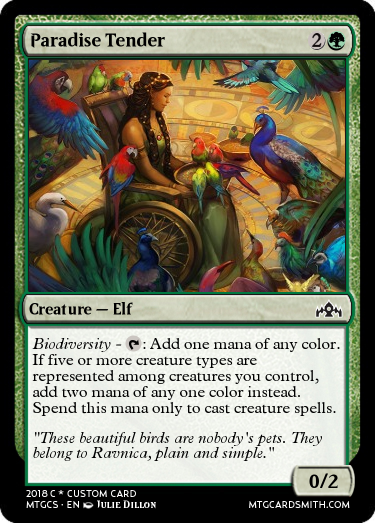 4) COLOR: Among your 7 cards, all five colors must be represented at least once. 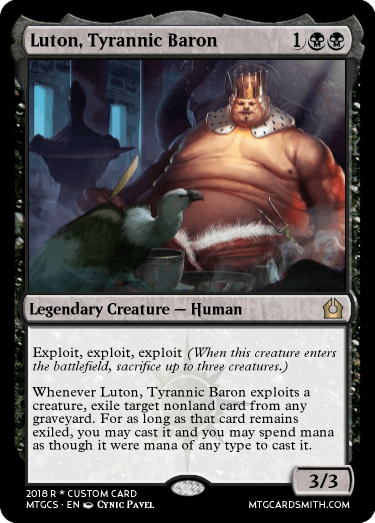 6)FLAVOR: Each of your 7 cards must have strong Dominarian flavor. More on this below. 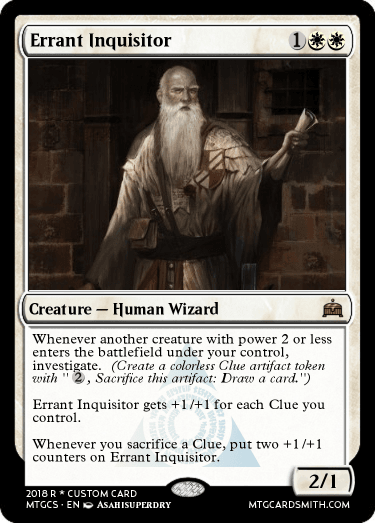 7) Each of the 21 constraints must appear EXACTLY once among your seven cards. Each card must use AT LEAST 2 constraints. 8) All cards must be made on or after December 27, 2018. No old cards will be accepted. 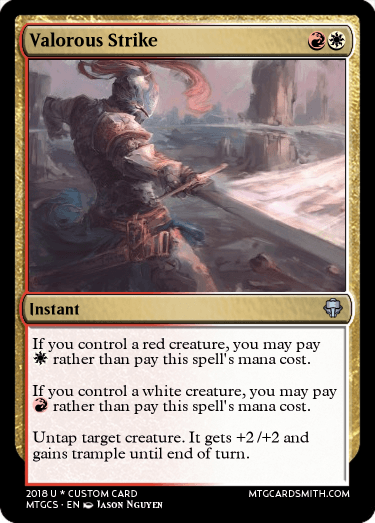 9) Cards should be appropriate for printing in the SAME generic standard legal set according to modern design principles. More on this below. 11) When you post your submission, for each card please indicate which constraints you used for it. 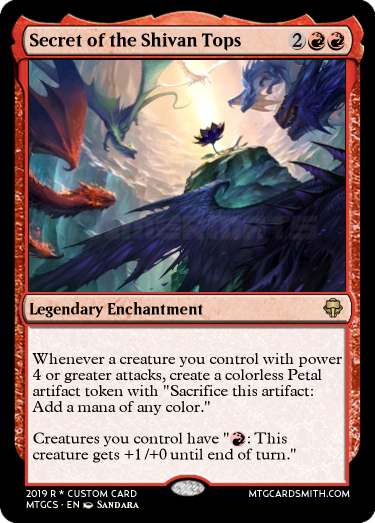 -Each of your cards should have a Dominarian flavor treatment like an actual WOTC set. 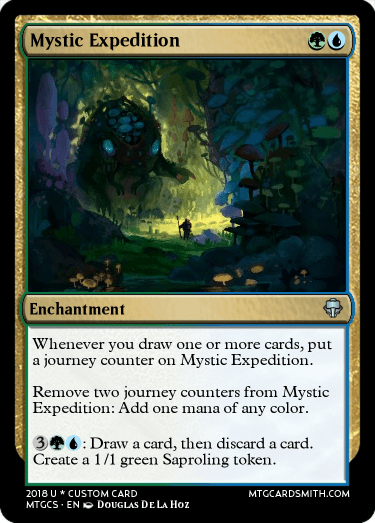 This doesn’t mean you have to design all named characters / places (You may of course do this if you want), but that regular cards must be appropriately named and flavored. 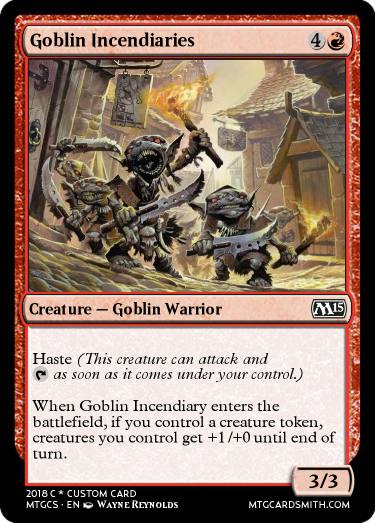 For example, on Dominaria, Goblins are generally Moggs and blue wizards are generally from the Tolarian academy. 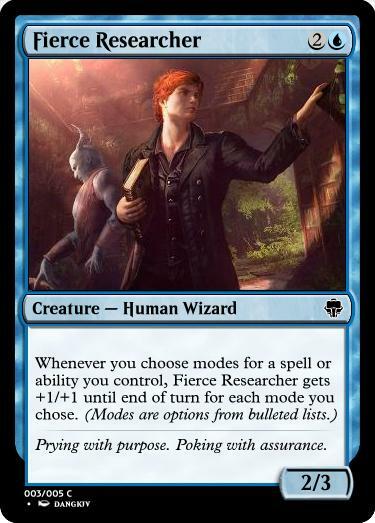 -If you are going to design an actual MTG character/location/event, make sure you research what colors it should be and that the mechanics on the card match what happened in the Mtg canon. 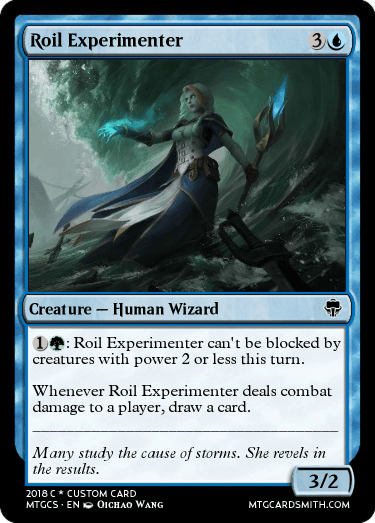 -All your cards should be compatible in the same standard legal set that is set on Dominaria. 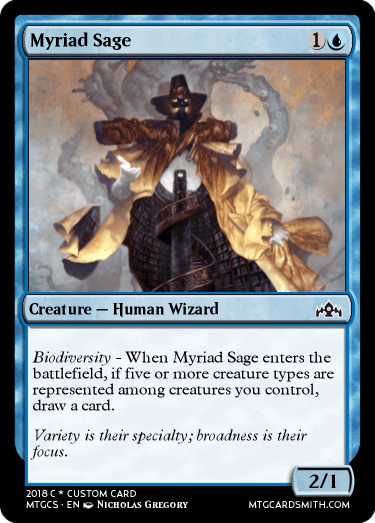 What this means is that all your cards should (generally) be from the same time period in Dominarian history and have named mechanics and themes that could coexist in the same set. For example, don’t design a card with flashback and a card with jump-start as they would never be in the same set together. 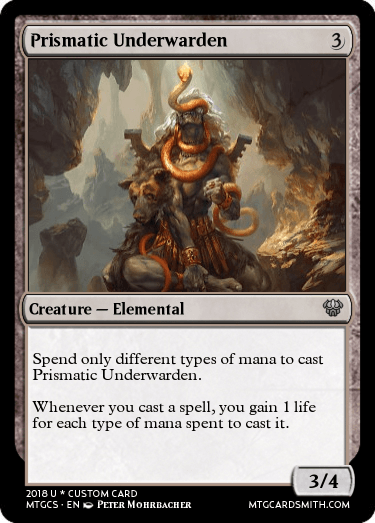 -The immense amount of constraints will naturally work to push up the complexity of your cards. Be very mindful of this, particularly at lower rarities. Each individual card will earn up to 25 points, and your entries as a whole will be graded out of 25 pts, so each submission will be out of 200 points. Every card will get feedback and be graded according to this holistic scale. 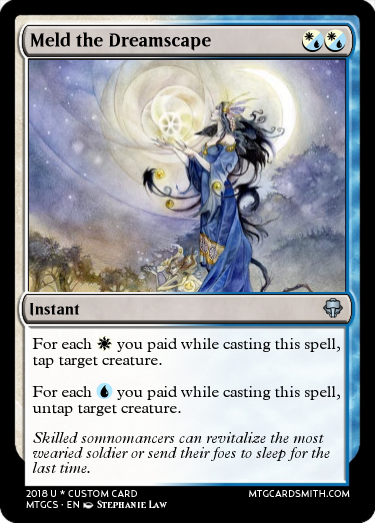 5 - Perfect connection between the flavor and the mechanics. 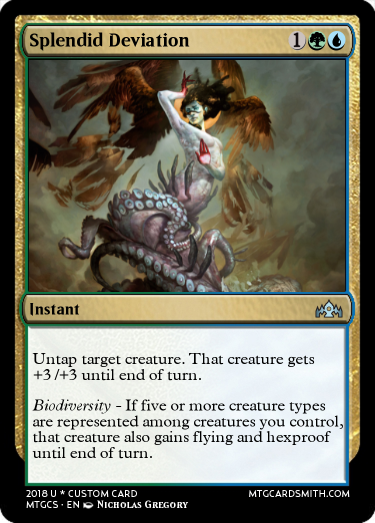 All card elements synergize to match the overall Dominarian flavor. 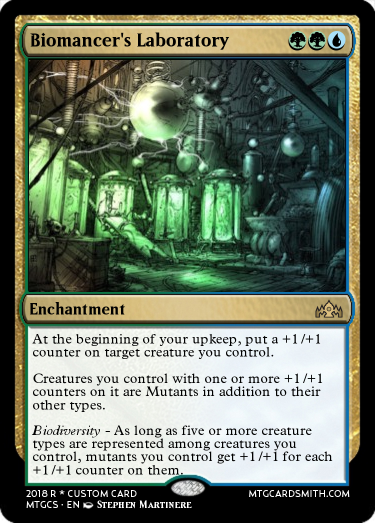 4 - Strong connection between the flavor and the mechanics. 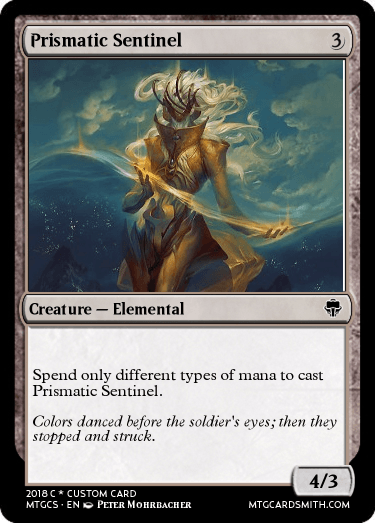 Most of the card elements synergize to match the overall Dominarian flavor. 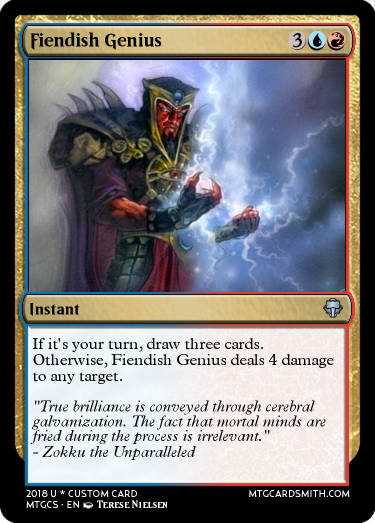 3 - Moderate connection between the flavor and the mechanics. 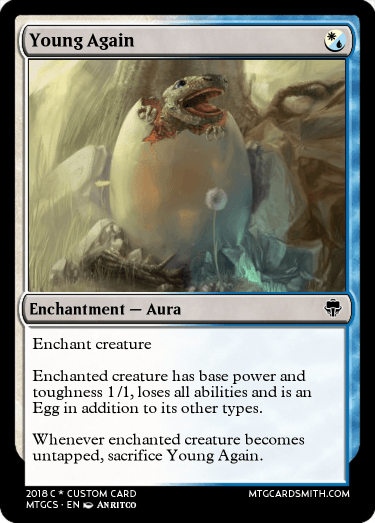 Some of the card elements synergize to match the overall Dominarian flavor. 2 - Weak connection between the flavor and the mechanics. 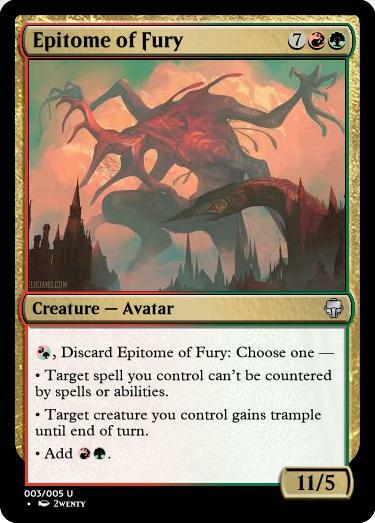 Few of the card elements synergize to match the overall Dominarian flavor. 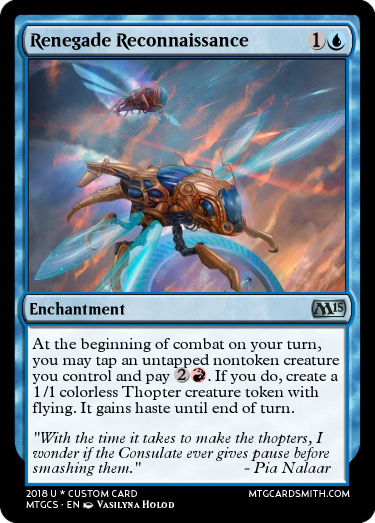 1 - Poor connection between the flavor and the mechanics. 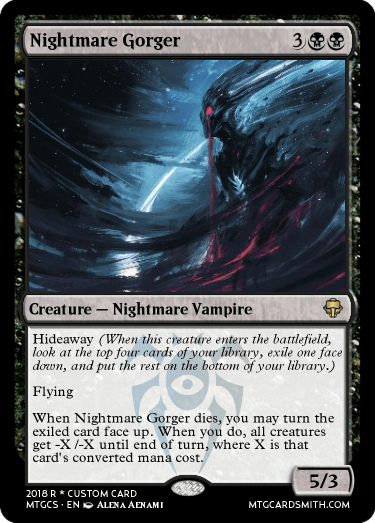 None of the card elements synergize to match the overall Dominarian flavor. 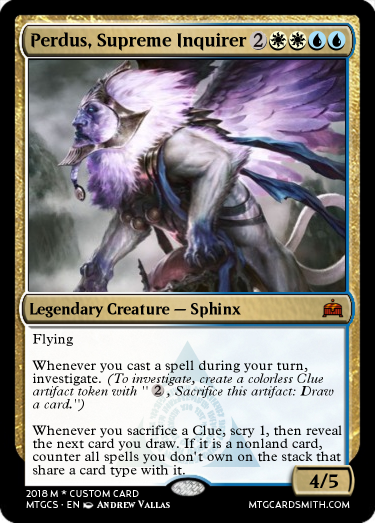 0 - Zero flavor connection between card name and mechanics. Is your overall complexity at an appropriate level? Are your common(s) actually common? Do all the cards belong in the same set? Are any contest rules broken? 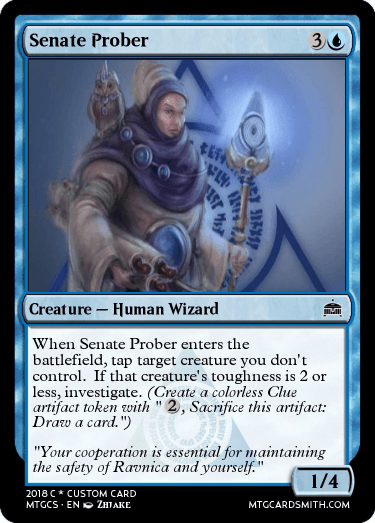 Do the cards hint at what your set might mechanically focus on? 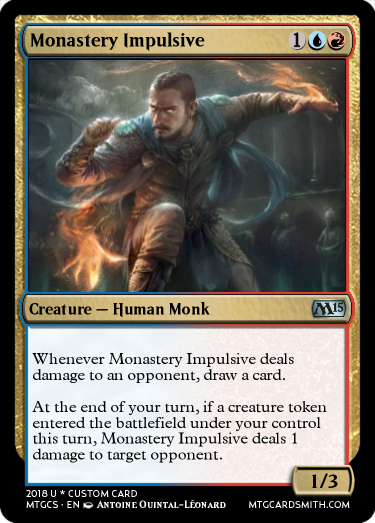 Does the Dominarian theme resonate throughout the submission? Does it come through loud and clear? For any existing lore, do the top-down designs do them justice? 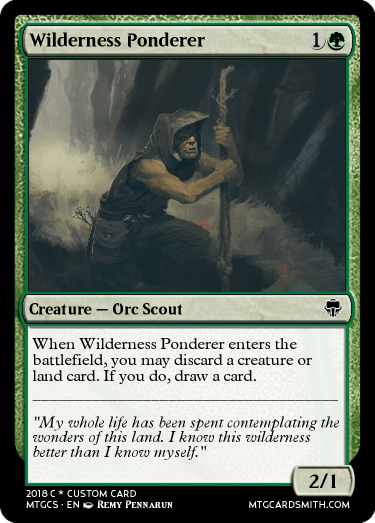 For generic cards, do they have enough Dominarian flavor? The final scoring will be determined by adding each contestant's total score from this challenge (out of 200) to their average score (rounded to the nearest whole number) from the previous six challenges (out of 100). 1st: 30 faves of your choice, 3 months of premium, and 1 featured card. 2nd: 20 faves of your choice and 2 months of premium. 3rd: 10 faves of your choice and 1 month of premium. This contest will close for judging on Friday, January 11th at 11:59 PM EST. No late entries will be accepted and no delay time may be used. The final challenge has arrived! Please feel free to ask any questions you have as the rules are particularly complex. Good luck! Question #1: Can I count "Who's" as one word for the purpose of restriction 7? I'm not sure how it works in English. Mtgsalvation generally is pretty good for researching MTG canon so I would start there. And Who's is one word. You are correct that riot would not count. 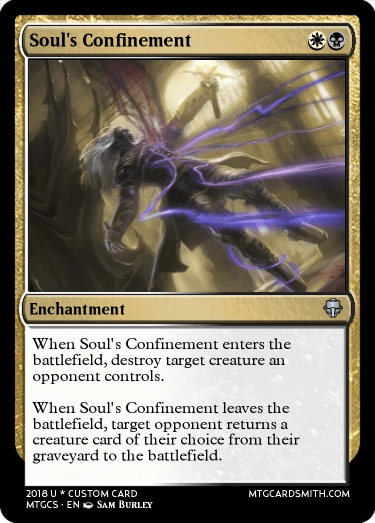 I think the bar for that particular constraint would be that if it triggers panharmonicon, it counts. How do you reward someone with a Premium? @bnew07 Ohhhh that makes sense. Just 3 days left! Remember, there is no delay time for this challenge so be sure to get your entries in on time! Today is the last day to get your entries in! 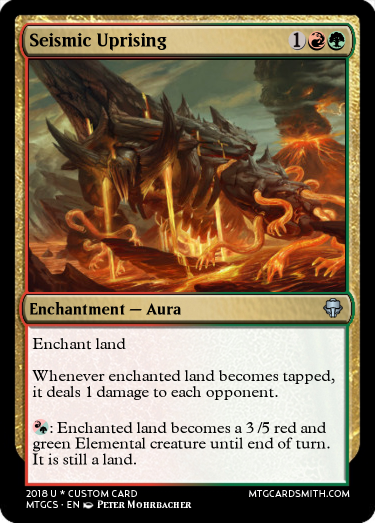 Flashback was originally considered for the last Dominaria set instead of Kicker, but was pushed aside because of how close it was to Aftermath in the same standard. 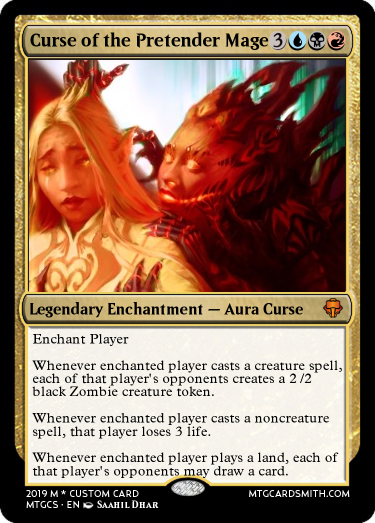 So I made a card with flashback to depict a memory: the moment when Liliana got her spark after she accidentally turned her brother Josu into a Zombie. 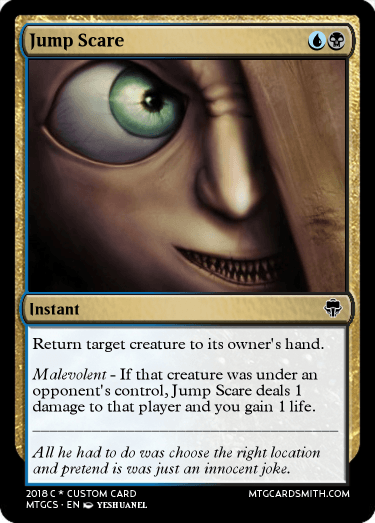 For a little twist, I made an "Instant Reanimate" variation that also explores blinking but in Black (which also triggers dying effects). It's mostly based on Momentarily Blink. 4. 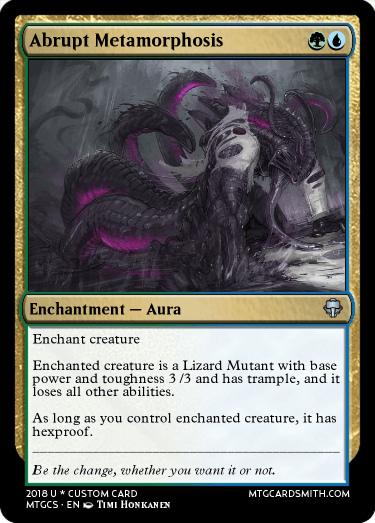 A creature with base power and toughness both greater than its CMC. 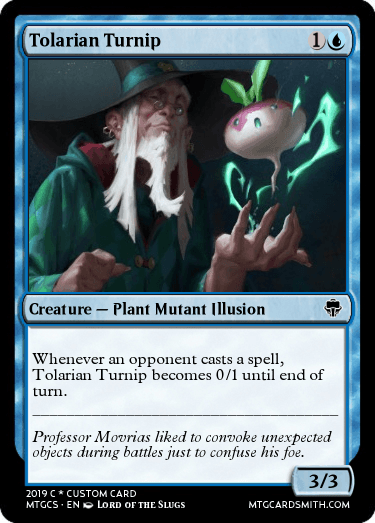 This card is a variation on a common staple in Blue, Illusions, except I replaced the usual "When this becomes the target of a spell or ability, sacrifice it" by this weirder variation where the illusion is put on an actual object (a turnip) so when the illusion disappears, you're left fighting with a vegetable. 21. 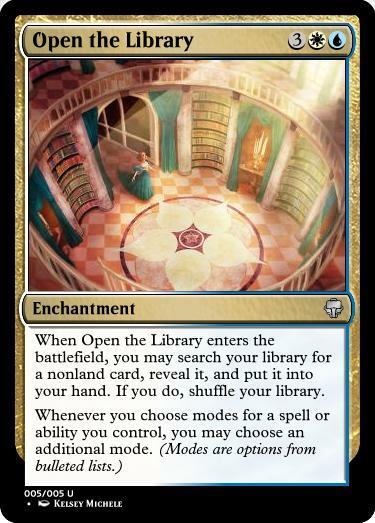 A card that searches or look at cards in your library. 20. 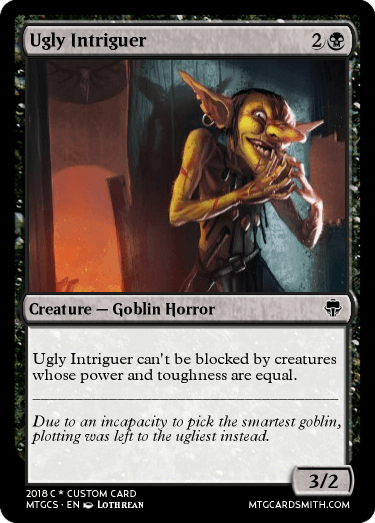 A card with a quote as flavour text by a famous MTG character. 12. 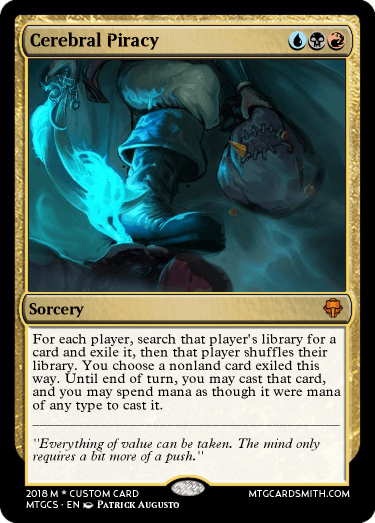 A card with "Costs N less to cast" in its text box. 16. 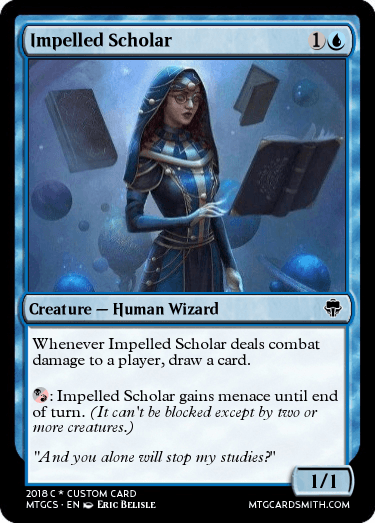 A card that mechanically hints at/references one of the Power Nine. This one is all about references. The Petals are mechanically Gold/Treasures but with a direct reference to the Black Lotus. Meanwhile, the firebreathing ability is a direct reference to the original Shivan Dragon. There's a synergy between the two abilities in that you can use firebreathing to help trigger the first ability, making kind of a free loop. 15. 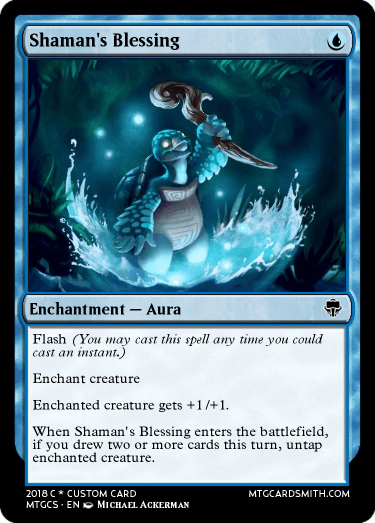 A card with an iconic creature type. 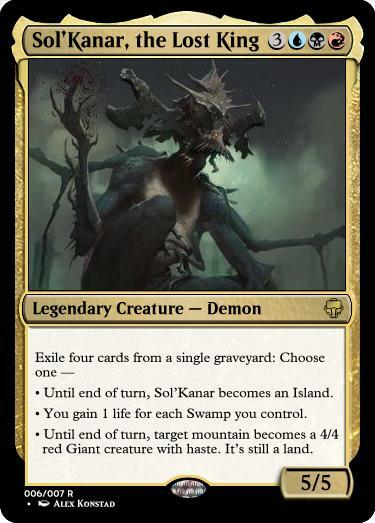 Sol'Kanar is one of the old characters that were considered for the latest Dominaria set, as mentioned by Mark Rosewater in his Odds and Ends columns. 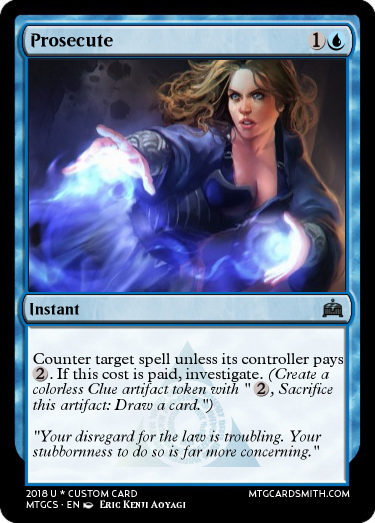 The original card is really weird by today's standard of design. There's nothing multicoloured about it, also the illustration is clearly green xD To fix that, I made it focus on each of its colours equally, but kept the emphasis on actual physical locations (the lands). 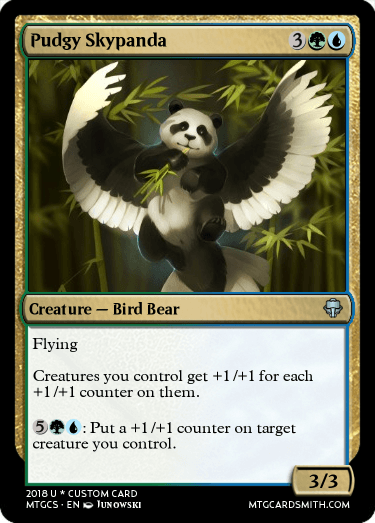 The second ability is also a reference to the original card. 10. 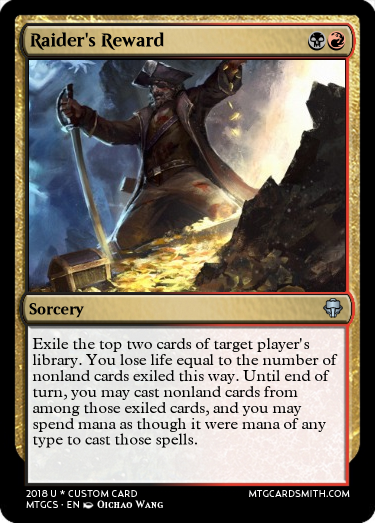 A card that is a guaranteed two-for-one if it resolves. 9. A card with an enters-the-battlefield ability. 19. 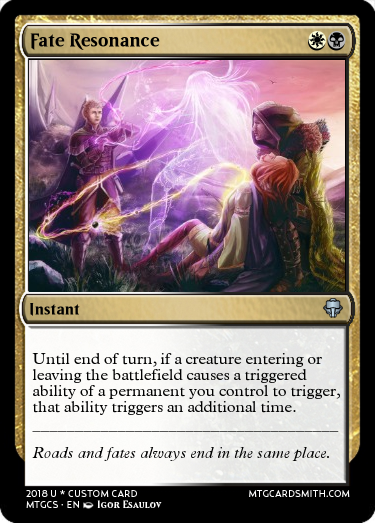 A card that can remove some type of permanent in some way. 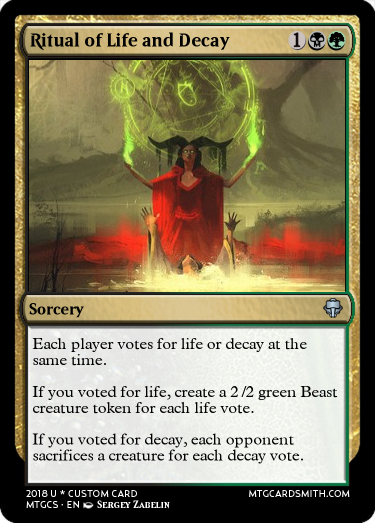 It's my last card of the whole contest, it's Dominaria, it's Mythic... 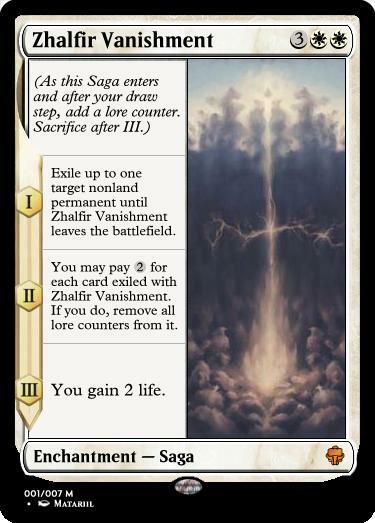 I allowed myself a little Saga x) It's meant to represent when Teferi made Zhalfir completely disappear to save it from the Phyrexians invasion... and then proceeded to lose his spark, therefore trapping the people of Zhalfir outside of time and space for decades ^^" It's a lot about time even mechanically: the saga story constantly goes back to the first chapter, you have to maintain the vanishing spell turn after turn, and more and more permanents are getting exiled as the game goes. Do you think there will be another of these? Cool! I'll look out for it. Benalish Squire is a simple card and my last design. 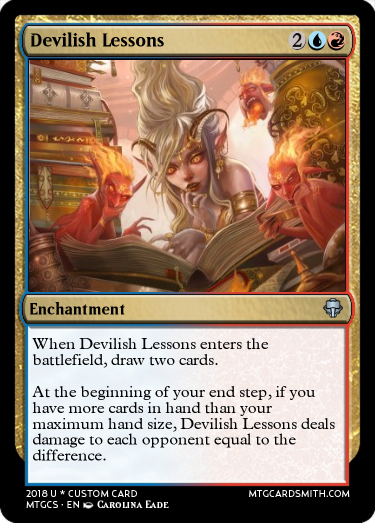 Surprisingly, its hard to create a card which is both interesting and has only one sentence of rules text. 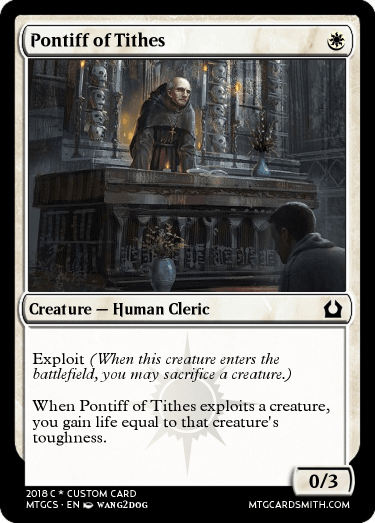 It fills a common role in white limited decks, of a card which is dependent on other creatures. 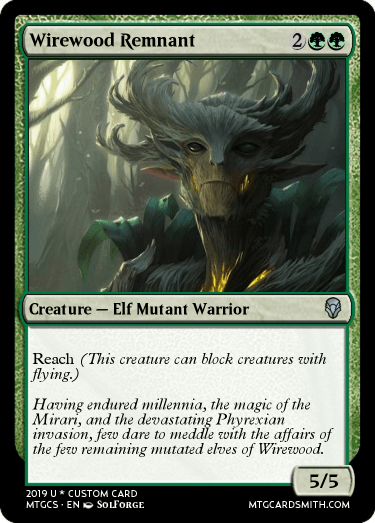 I'm not sure how good this card is, considering you can only usually consistently start casting it on turn 4 (maybe should be one creature), but I do also enjoy the fact that this squire is literally two Squires. 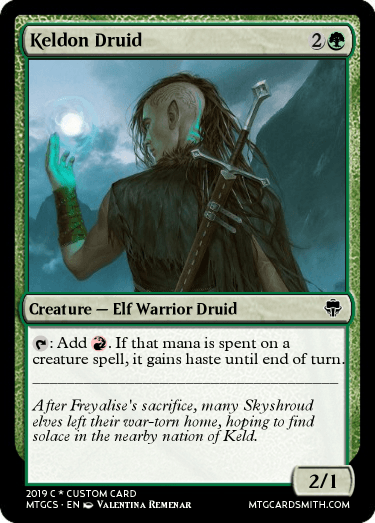 Keldon Druid is a combination of Elvish Mystic and Goblin Motivator, taking on the flavor of a Skyshroud Elf who joined with the Keldon tribes while Radha is grand warlord. 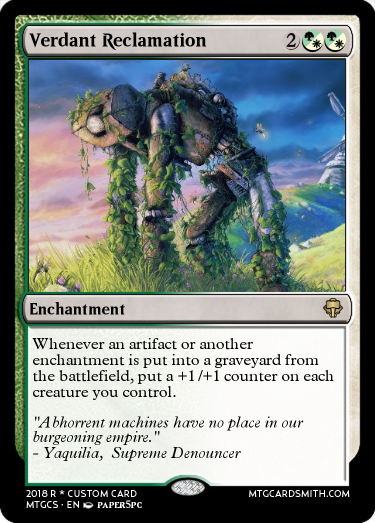 Forgotten Automaton is a unique effect by being graveyard hate that is activated while being within the graveyard. 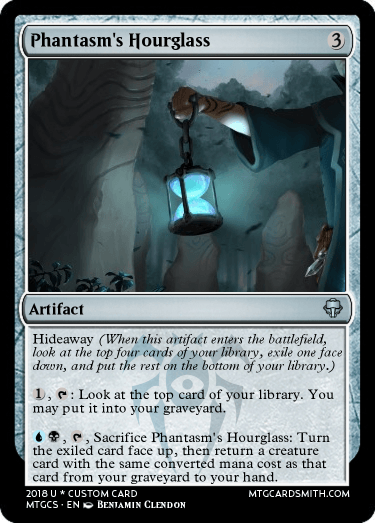 Artifacts often have graveyard hate in order to make it accessible to everyone, and this was also made a creature to give it a bit more value. 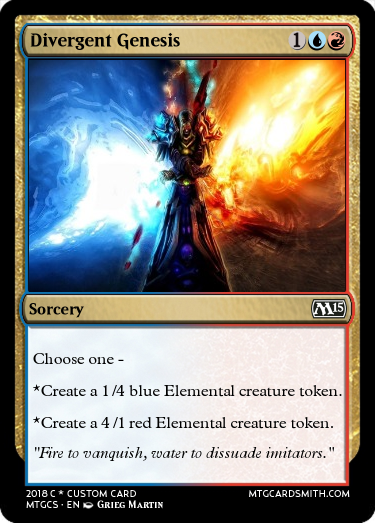 Skyshroud Remembrance is an interesting sorcery that uses the Domain mechanic to choose multiple options the more colors you play. 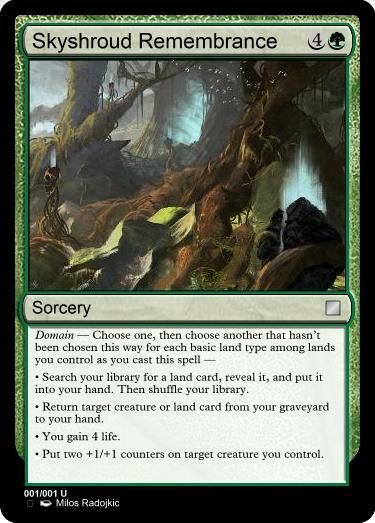 It always chooses two even if you just have forests, so that when it resolves it always results in a two-for-one. 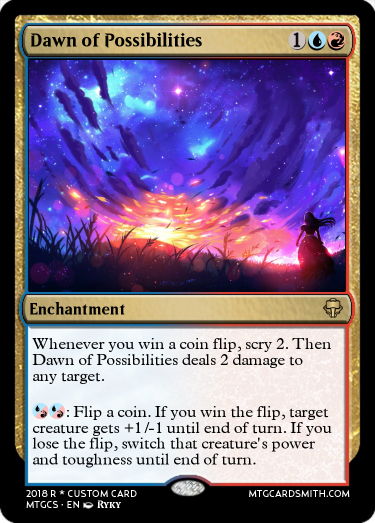 The term "guaranteed two-for-one" is very loose, as this card isn't a two-for-one if a) you don't have any basic land types or b) you can't fulfill two of the choices, but I figured that those scenarios are so unlikely that this could count as a two-for-one. Notably, there are only four choices, so this encourages you to play three colors, but doesn't insist that you play more, as each choice must be different. 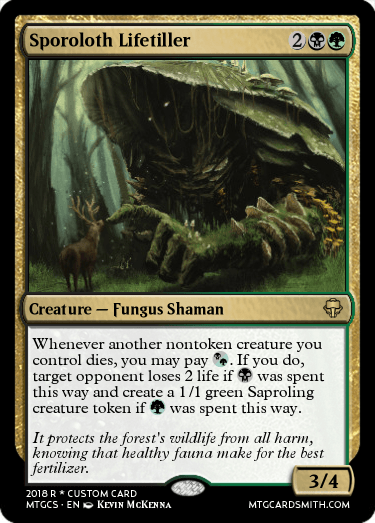 In monogreen, this is a semi-weak effect, in two-colors it is a good but somewhat random mix of abilities, and in three colors it gives you a fairly powerful spell. Another thing to note is that all of the abilities are mostly minor, so even getting all four of them is only slightly better than just getting two of them. 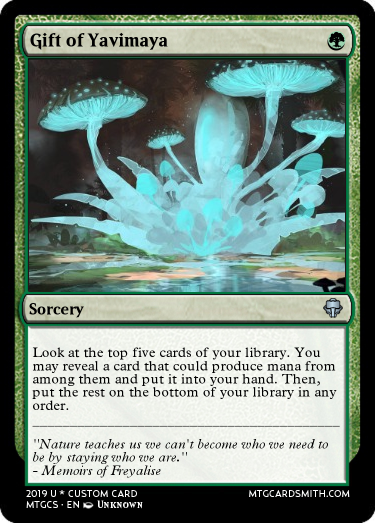 Foregone Erudition is a reference back to one of the two least referenced of the power 9- Ancestral Recall. 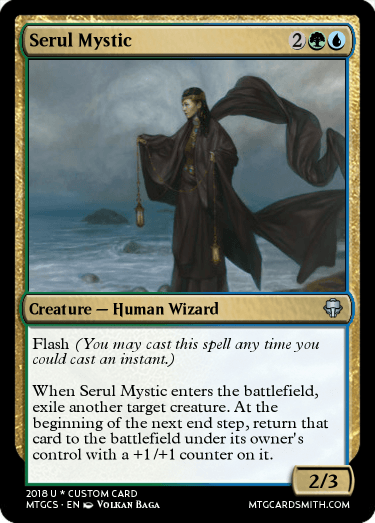 3UU isn't bad for draw 3 at instant speed, but you really want an extra ability, hence the bonus if another one of your instant or sorceries was countered. 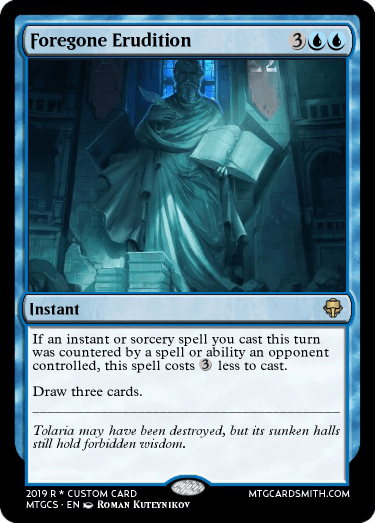 This also works with the flavor behind Tolaria being destroyed, though still containing the academy ruins which have knowledge. Demon of Diminished Hopes is a semi-traditional Demon, require a sacrifice upon entrance but in return killing off an opponent's creature. 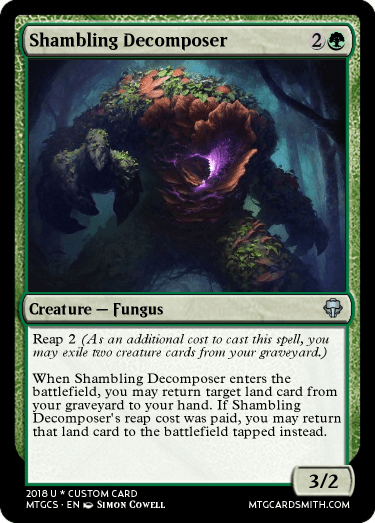 If you have no other creatures, it is just a 5 mana 6/6 flying, thus a weaker (though not by too much) Doom Whisperer. Also, a callback to older demons which almost always required a creature sacrifice. 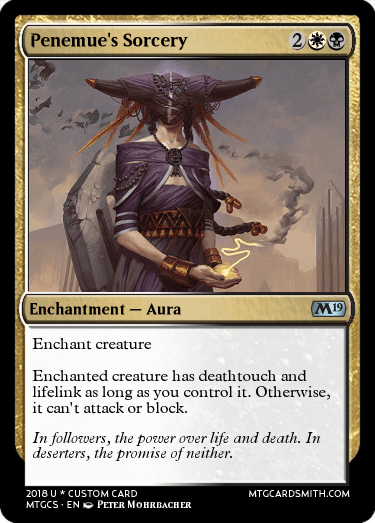 This final enchantment is a take on the curse that afflicted both Jaya and Lim-Dul, that is, Mairsil. 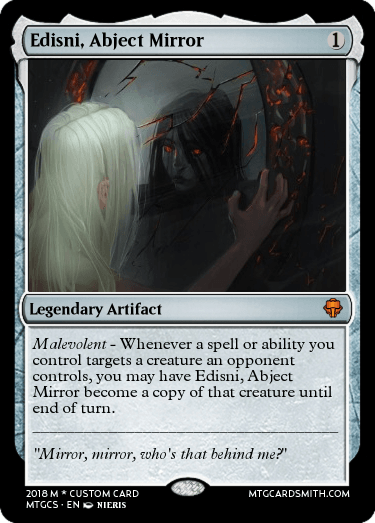 In the story WOTC tells us, Jaya's spark igniting destroyed Mairsil completely, however, because I like Mairsil as a villain and the "destroyed completely" story can be written off just as what they believed, I decided to interpret it that the spirit lived on, just no longer in such a form. 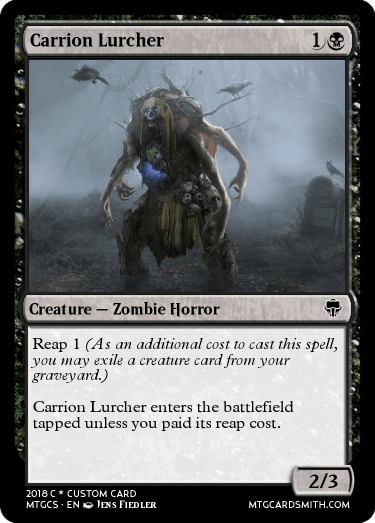 Mechanically, Mairsil is tied both to draining the curse-bearer's power, as well as granting necromantic abilities, hence the 2/2 zombies. This challenge was Tough (with a capital T). 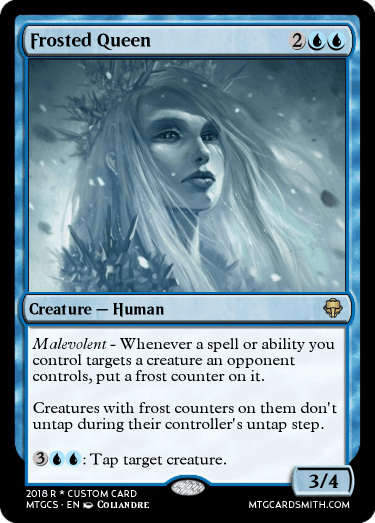 I spent a lot of time trying to come up with my first card, and from there slowly designed the rest in order to fill in gaps. Overall, these designs aren't incredibly cohesive as a single set, but they all would work within the same set, and multiple of them somewhat come back to a multicolor theme. Alright, here are my final entries! 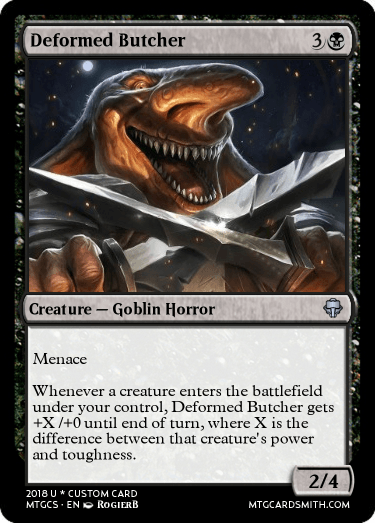 A nice draft staple with plenty of utility. 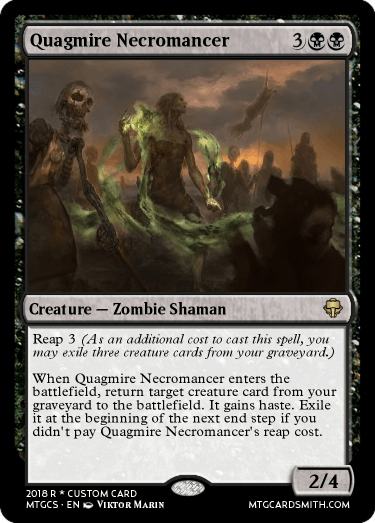 It would normally be used to take care of opposing creatures, but can remove pesky graveyards in a pinch. Not much else to say. 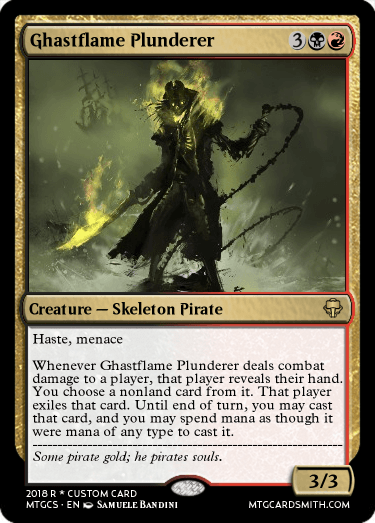 A game-changer for Limited, Standard, and possibly other Extended formats. Having another Llanowar Elf that doesn't have summoning sickness and is harder to remove is amazing. 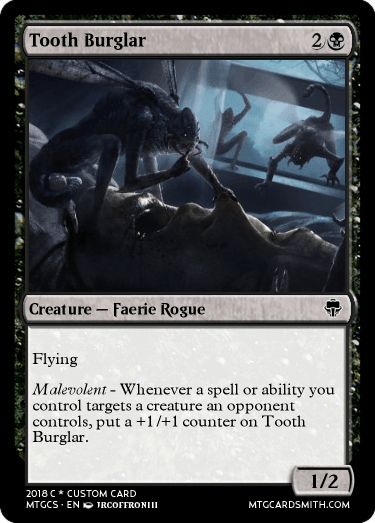 It's not a true Moxen, not even a Sol Ring even, but it is still powerful. 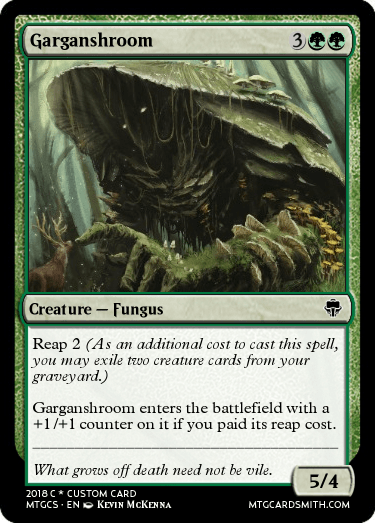 Also, how about that flavor text? 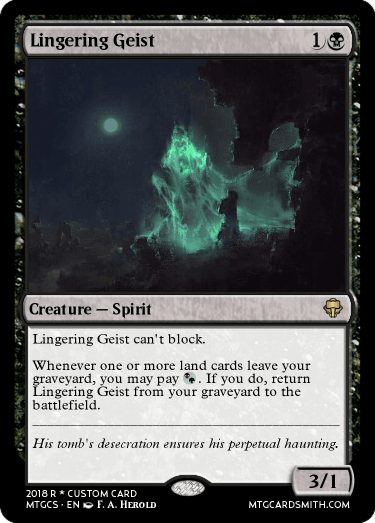 This card aims to smooth out Historic decks with pseudo-ramping and fetching a Historic spell. 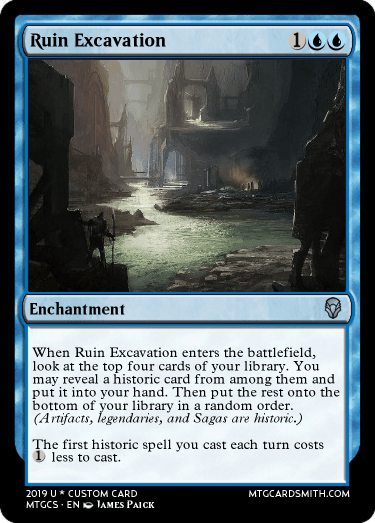 Ruin Excavation isn't huge, but it is fun and flexible. 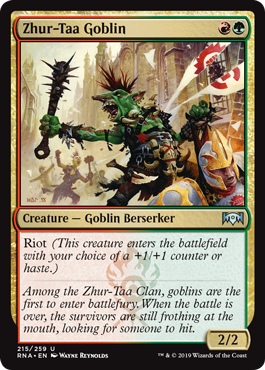 While perusing the Dominaria set, I was puzzled by the abundance of Goblin tribal, but not many token producers. 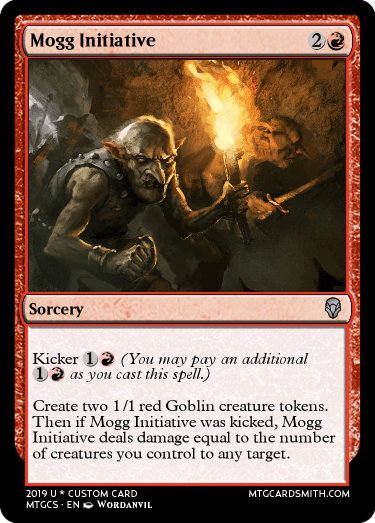 Mogg Initiative aims to solve this problem with another flexible spell that is potent in Limited and casual MTG. Remember those weird Elves from Onslaught? Because they have mutated, I took artistic licensing to give some a longer lifespan. 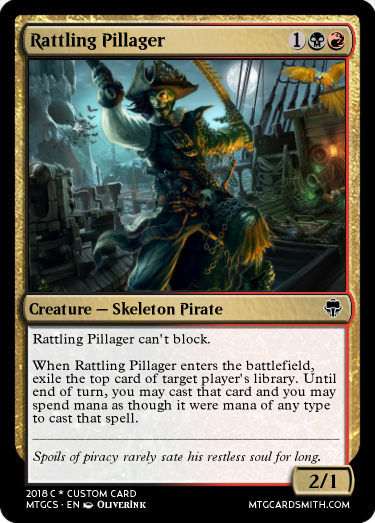 A solid beater for Limited. 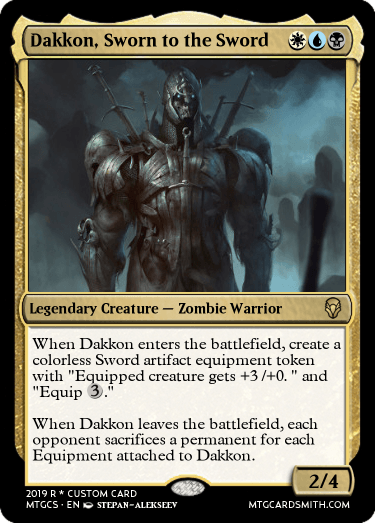 Because Dakkon's death was never confirmed, I brought him back as a sword-smithing Zombie, eternally searching for his masterpiece. 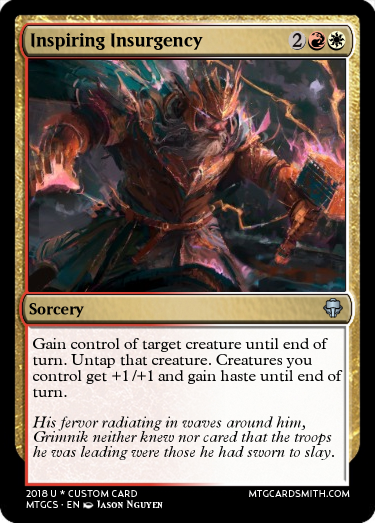 This version of Dakkon synergism with Dominaria's Historic theme and the minor Equipment theme, but I made him with focus for Commander. Also, did you catch that Dakkon makes Greatswords? 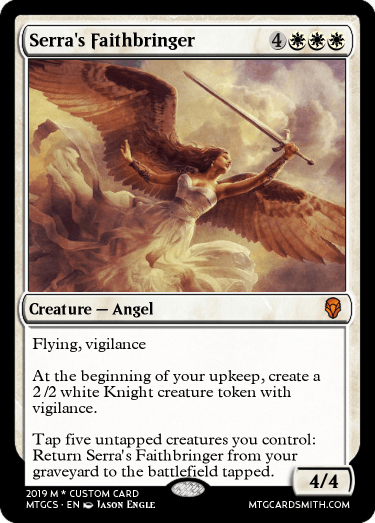 Serra Angel is back, and now it's leading an army of faithful Knights that will never keep her dead for long. 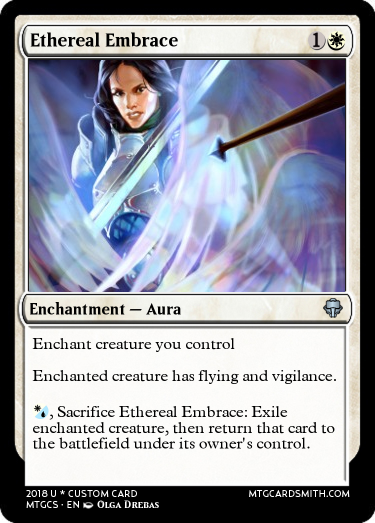 Left unchecked, Serra's Faithbringer will grind your opponent out. 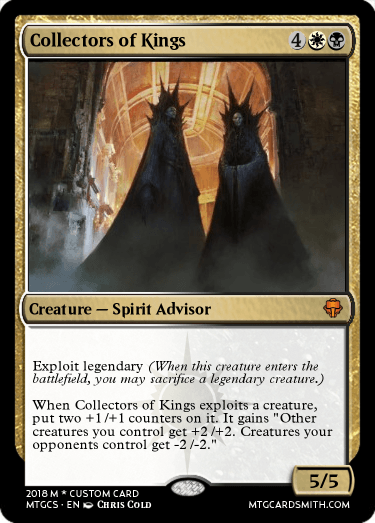 Also, the Knights have vigilance, so they can attack and reanimate Serra's Faithbringer back that turn. I'm very proud about how that worked out. Phew! This was the hardest 'smithing challenge I have ever completed in my 5 years on MTGCardsmith! Congratulations to @ningyounk and @TheCenterOfTheUniverse who finished their entries. All right this contest is now closed for judging! All right everyone the results are in! Refer to the google doc link below for all the written feedback and scores. Before we get to the results, I just want to say that this challenge was insanely difficult (as some of you mentioned). I specifically designed it to be the mother of all challenges so each of you should be proud of your efforts. Additionally, I want to thank you all for participating in this mega-challenge through 7 rounds over the last few months. I know it was a big commitment and I witnessed everyone growing and improving their cardsmithing skills along the way. I have learned a ton myself just from the judging. Now to the final results! The first number is each Cardsmith's average score from the other six challenges (out of 100) and the second is their score from this one (out of 200). The total score (Out of 300) determines each cardsmith's place. Congrats to all three of you and to the 1st Great Cardsmith Designer Search Champion, @ningyounk !!!! @ningyounk : 30 + (4) = 34 faves of your choice, 3 months of premium, and 1 featured card. @TheCenterOfTheUniverse : 20 + (5) = 25 faves of your choice and 2 months of premium. @Temurzoa: 10 + (4) = 14 faves of your choice and 1 month of premium. Please request your faves in this thread. I will award premium to each of your accounts this week. @Corwinn can you please work with @ningyounk to arrange their featured card? I also want to note that I will soon be posting s thread for feedback on this entire mega-challenge, so I encourage you all to contribute and provide your input about what you liked, didn’t like, and suggestions for improvement when the time comes. Congratulations to @ningyounk for winning first place! Concerning the grading, I understand most of the reasoning, but I am confused why multiple instances of one requirement was not allowed. Was it explicitly stated? Yes it was stated in entry criteria #7. I included it as a rule mostly to make the challenge harder. All premium subscriptions have been sent! Congrats, @ningyounk! Thanks for the superb contests, @bnew07.